Refurbishment and upgrading, for the LB of Islington Lifelong Learning Department, of two community centres – the Islington African Project and the Crouch Hill Community Centre - two of the 8 partner organisation of the Islington ICT Strategic Partnership participating in the UK-Online GOL capital funding programme (Round 3). 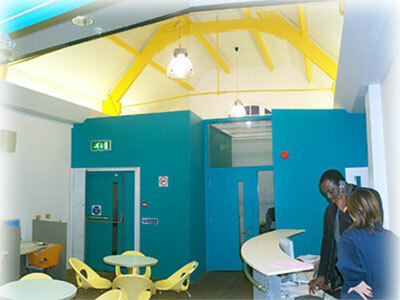 The refurbished IAP (now known as the Islington Learning nCentre) accommodates a flexible community space / assembly rooms with removable space dividers, IT classrooms, an internet cafe, one-to-one interview rooms and offices for teachers and staff. Full accessibility has been provided to all levels and spaces, in accordance with DDA requirements. The design offers innovative visual references and encourages new user/staff and user/user inter-action processes, thereby successfully challenging and removing pre-refurbishment tendencies towards institutionalisation. Contract Cost: £ 308,500 (including FF&E) in 2003 Completed May 2003 Services provided: Feasibility Study, Project Management, Full Architectural Services & Planning Supervision (H&S); Interior design & FF&E procurement.